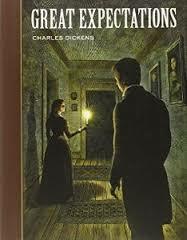 A summary on Great Expectations examine one of Charles Dickens' most well known classic novels. The single most influential genre that appears in Great Expectations, the genre that may be named as characterizing the work as a whole, is the bildungsroman. This term denotes that type of novel that relates the events of the “coming of age” of the protagonist. The conventions of this genre include the establishment of the hero’s youth and innocence as the novel opens, and a series of dénouements through which the hero learns the lessons of life. A bildugnsroman may be written as a fictive autobiography, in the first person, as is Great Expectations, or it may be written in the third person, as a fictional biography. I think it fairly obvious that the book, taken as a whole, obeys the conventions of bildungsroman. We follow Pipp from his “…first most vivid and broad impression of things…” and through the tale of his maturation concerning work and “expectations”. The genre requires successive educative epiphanies involving the nature of life, people, and morality, and these are provided. But it should be noted that Dickens overlays this genre and its required content with stylistic devices taken from other literary genres—satire, Gothic horror, and fairy tales—and that these devices are frequently in conflict with the nature of the central genre. Specifically, bildungsroman is a “romance” genre, but it is also essentially realistic in its nature. The elements of satire, horror, and fairy tale that appear alongside it in this novel all take away something from the realism of the story. But departures from realism are not solely a function of sentimentality; they are also occasioned by the requirements of the other genres utilized in this novel. George Orwell has noted that Dickens was somewhat addicted to the burlesque; with respect to Great Expectations he cites Pip’s first encounter with Magwitch in chapter one as an example of Dickens being overwhelmed by his love of the burlesque and being seduced into a lapse from realism; Orwell points out, quite correctly that no starving man would speak as Magwitch speaks. Burlesque is perhaps not a full-fledged literary genre, but it is closely related to, and is a handmaid of, satire, which is. There is much satire in this novel. Drabble defines literary satire as a poem or prose composition “…in which the prevailing vices or follies are held up to ridicule…”. One of the devices of satire is to create an archetype in order to embody what one wishes to ridicule in a character. Gissing points out that Mr. Pumblechook is a satirical character, that he seems “funny” from a distance, but that “…near at hand he is seen to be a very sordid creature…”. Mr. Pumblechook embodies dishonesty and hypocrisy in that he pretends to have been the maker of Pip’s fortune, and then deserts Pip when he is brought low. The requirements of satire are obviously at odds with the requirements of bildungroman. For satire derives much of its force from being unrealistic. The great satirists, Juvenal, Rabelais, Joseph Heller, all present an overstatement of their case. Because this is so, the satiric elements detract from the pretension of being “biographical” that is embedded in bildungsroman. Another genre that appears in Great Expectations, and one that also detracts from its realism is Gothic horror. Satis House, with its grisly proprietress is one Gothic element. Pip compares Havisham to a dressed-up skeleton he had once seen: “Now, waxwork and skeleton seemed to have dark eyes that moved and looked at me…”. This aged misanthrope wishes all love to fail and she wants the beautiful and haughty Estella to break Pip’s heart. The atmospherics provided are great for a melodramatic stimulation of the reader’s affect, which is what Gothic horror is about, but it carries a risk of destroying the plausibility of the story, a risk at odds with the attempt to create the illusion that what is here being represented is something with roots in the possible. It is interesting to note in this context that, according to Davis, Dickens got the idea of Miss Havisham from the true story of an eccentric Duchess living in Paris. The story of this woman, a story that Dickens relayed to Forster, involved extreme eccentricity, but it did not involve anything approaching the mummified pathological specimen that is Dickens’ Havisham. Charles Dickens a Tale of Two Cities essays analyze the novel written about historical facts on Thomas Carlyle’s The French Revolution: A History. Charles Dickens Oliver Twist essays analyze Dickens' novel about an orphan boy named Oliver Twist. Charles Dickens Poems research papers examine Dickens' popular poems such as A Child’s Hymn, Gabriel’s Grub Song. Books by Charles Dickens research papers look into his many novels that were deep with character studies that interwove many of the social concerns of his day. A Tale of Two Cities Themes essays discuss several major themes that run throughout the story in Charles Dickens’ novel. Tale of Two Cities Characters essays analyze the novel, by Charles Dickens, about the French Revolution. Symbolism in Great Expectations - Symbolism is a literary technique frequently employed in Charles Dickens' Great Expectations. Paper Masters writes custom research papers on A Great Expectations Summary and examine one of Charles Dickens' most well known classic novels.